You must make reservations at least 5 minutes in advance of the time at Wayfare Tavern. Muni: Clay & Montgomery stops; Sansome & Sacramento stops. Cable car stops one block away on California Street. 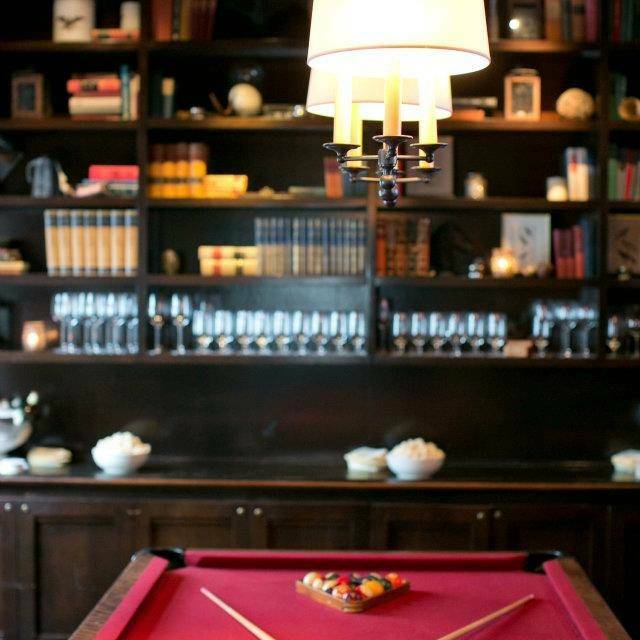 Within our second floor dining room, we have a Billiard Room available for parties up to 16. The room has double pained glass doors and features an antique tin ceiling, vintage red felt pool table. To make ordering easy, the room has a red "hot" phone which direct dials to ordering food and cocktails. Reservations are suggested and the room is available upon availability. 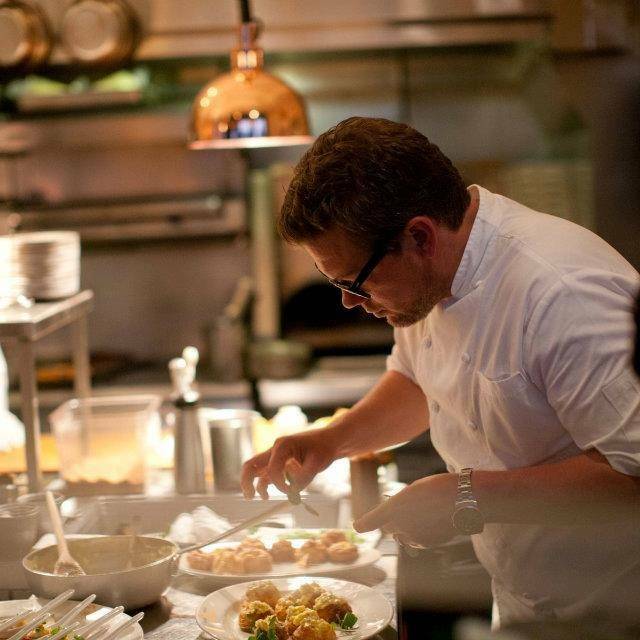 Chef Tyler Florence brings his passion for high quality and style to San Francisco with his new flagship restaurant, Wayfare Tavern. 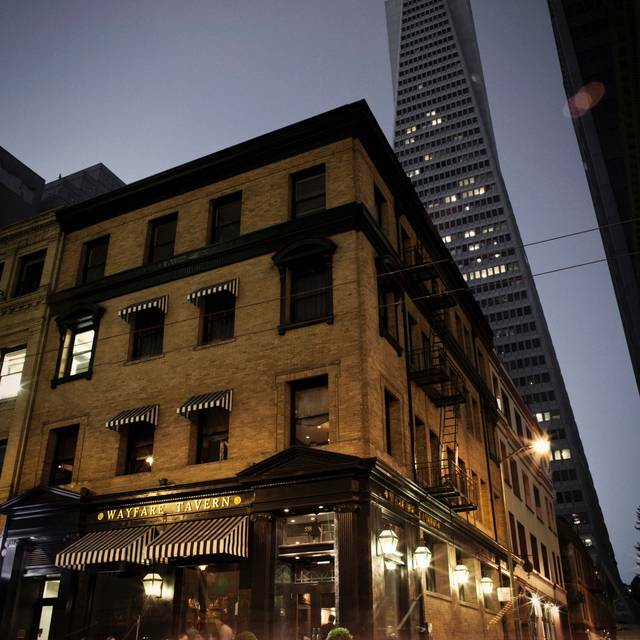 A classic San Francisco Tavern featuring authentic American dishes inspired by local cuisine at the turn of the 20th century, the menu ranges from classic comforts to rustic delicacies. The beverage menu features locally-sourced wines including a selection of Florence's own label, quality draft beers and organic root beer as well as classic Victorian-era cocktails. 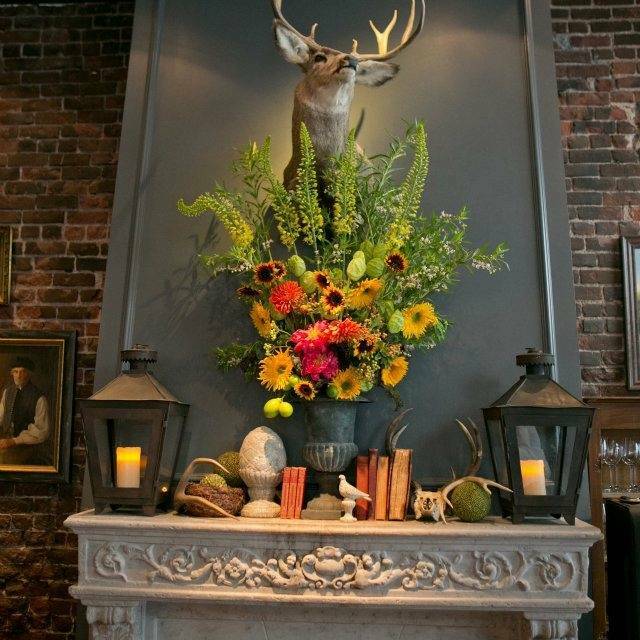 All three floors of the restaurant have been designed keeping historical accuracy in mind making Wayfare Tavern reminiscent of a Victorian parlor and an Edwardian men's club, where anything goes from black-tie to blue jeans. 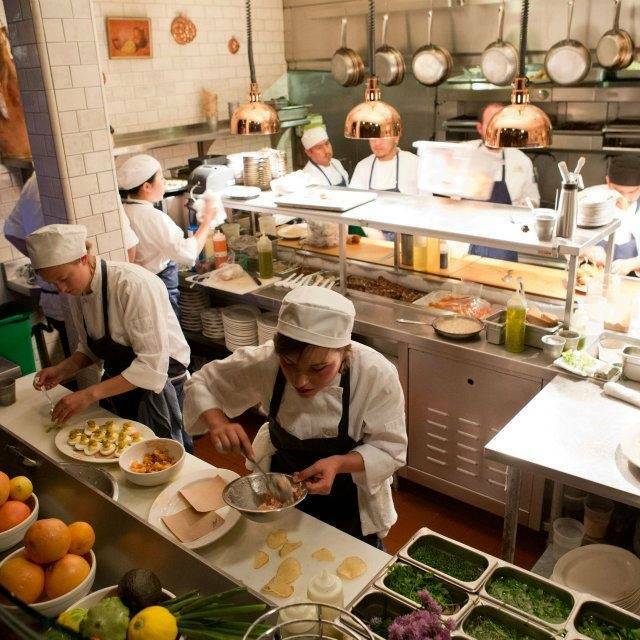 Pull up a stool to the Chef's Counter at the open kitchen and look on as Chef prepares your lunch or head to the Library and Billiard Room for a game of pool. 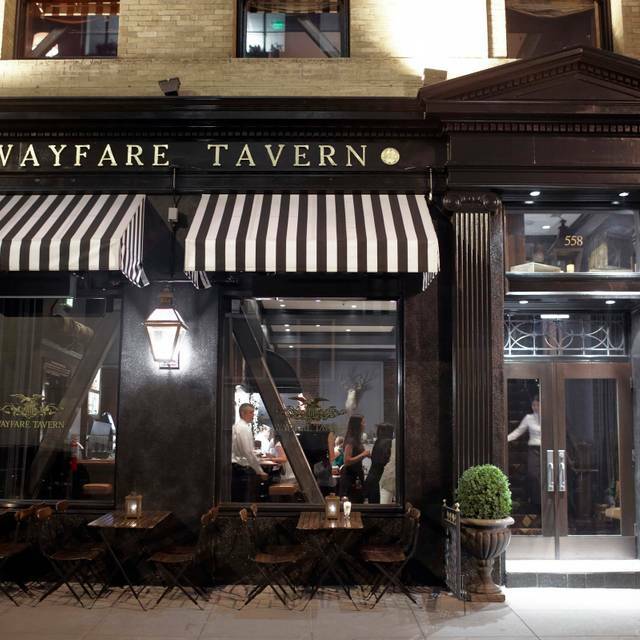 Wayfare Tavern is a truly unparalleled dining experience translated from a century ago. Photo: John Lee. The fried chicken is ridiculous! The food and service were fantastic. Although the noise was high, it was a Saturday night and that's likely to be the case anywhere. The burger with avocado was a good choice. Great staff. They accommodated five extra people on a busy night with professionalism. Great work. Lovely, authentic styled small and elegant restaurant with excellent attention by all the staff. The fried chicken is, indeed, world class- but their other stuff is good too! I’ve been to Wayfare a few times. It’s a fun atmosphere - the food isn’t top notch. Pasta was over cooked and wilted. Grilled chicken was dry and over cooked. Lovely sever just not really a place I’m rushing to go back to. Sorry! 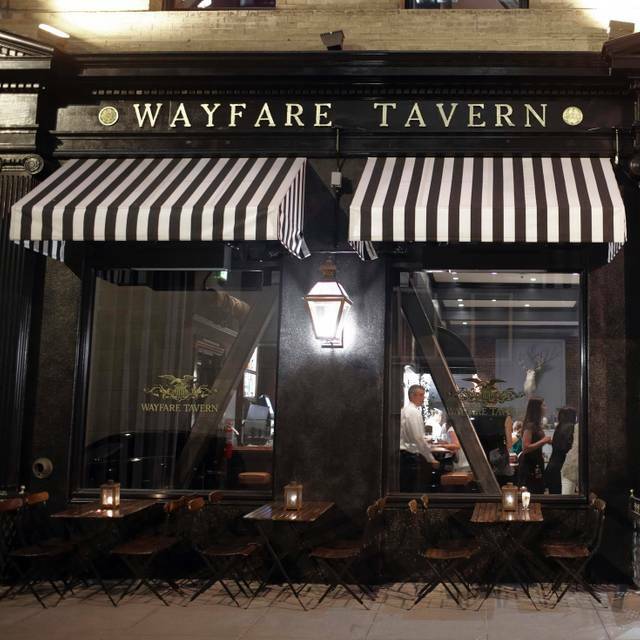 Wayfare Tavern is a classic business spot that is a treat. 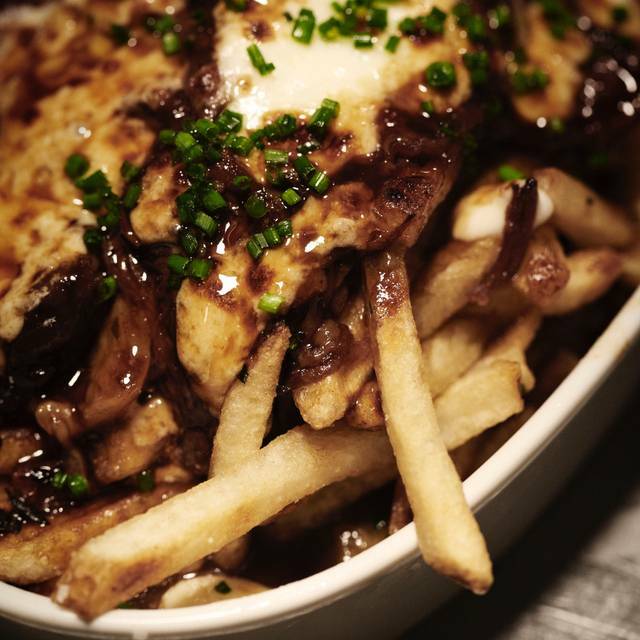 The menu is an interesting mixture of classics and local fare inspired new creations. The food is well made and served. The waitstaff is knowledgeable and experienced. The wine and cocktail list are well conceived. My only criticism is why have lunch reservations if the tables are not available at the reserved time. We had a wonderful experience at Wayfare. They made the birthday celebrant feel very special. They made it a very personal experience. The popovers were not their usual warm delightful treat. Always greet service and food. We have been several times and it is one of our favorite restaurants. Good bar and wine selection. Late hours during the week, which makes it a good place for it to go after a movie or show. What a great place!! Decor, vibe, food, all top notch! I had the pork chop, my Girlfriend had the fried chicken. We both could not get enough of either one. Great place for a special occasion. Outstanding experience at Wayfare! Showed up early to my reservation and they were able to seat us quickly. Great food and service!! Can't wait to be back. We were seated literally right next to another couple, extremely close to the point where you can’t have a private conversation, even though there were plenty of tables for 2 that would have given each of us ample space & privacy. Great!! but OpenTable did not update my reservation :(. Service was off. We waited 45 minutes for a cocktail and to order our meal. We had to ask to place our order 45 minutes in. Pork chops were over cooked and dry. Other items ordered were better. Amazing as always! 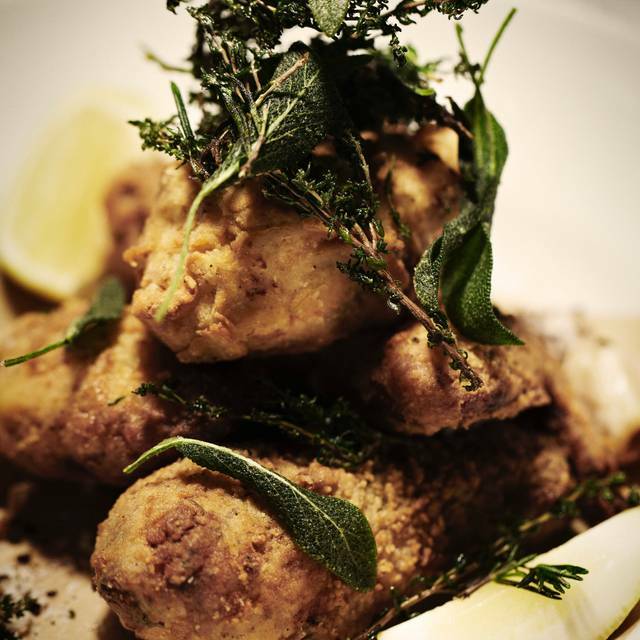 The fried chicken, burger and beef tartare are our favorites! Our waiter, Joe, was friendly and helpful and everything we tried was delicious (five of us shared as many things as we could). Looking forward to returning and trying more! There was a piece of hair in my colleague’s salmon dish. We were seated 20 minutes past our reservation time, even though there were five open 4-top tables available when we arrived. It took another 20 minutes to get water after being seated; 30 minutes to receive our cocktails, which we ordered once we sat down; 45 minutes and three times asking different wait staff to finally receive bread; also 45 minutes to put in our food orders. Food came out in a good amount of time thankfully, and it was all great. Can't complain about the food, but the service was extremely slow, which would hinder me from going again, as there are plenty of places nearby with great food but much faster service. We had the best time with your staff and the food was amazing. Best best experience!!!! Service and ambiance were great. Fried chicken was good but pricey for $25 dollars. Nice for a business lunch once in a while. Outstanding food, great service, delightful space. It's obvious why this place as been so popular for a while now. I am not a great foodie of fried chicken but I thought the white meat was dry. The leg was juicy. My wife had the smoke turkey club which was fantastic. The restaurant was not worth driving from Danville CA. Was recommended by my Son. He thought that Fried chicken was very good. Oh well, I still like Tyler Florence. Will try his other restaurants. Great food. Great vibe. Shared the burger with egg, mac n cheese, salad, burrata whipped mashed potatoes with GF. Too full for dessert! The food was amazing and I loved the atmosphere! It was the perfect place to celebrate my husband’s 50th birthday! I really enjoyed my lunchtime experience here. Felt like an adult in a town that increasingly caters to a young, casual tech crowd. A bit old world with massive portions of very flavorful and well-prepared food. Would definitely come again. Good food. Well executed. Pretty boring menu. Service rushed us which was not ideal. We asked them to pace the meal out and they brought entrees while we were still eating our starter. Food is good but the service could be better. We had a 1pm reservation for a client meeting. Due to the bad weather we all barely made it to SF in time and so we arrived in casual travel clothes. Apparently appearance is everything here. We waited to be seated until 1:17 (despite arriving at 12:56) and watched not one, not two, but three groups of 3 professionally attired ladies and gentlemen arrive, ask if they had any availability and be immediately seated. Two individuals (separate parties) were greeted as regulars. I completely understand taking care of your regulars but it got ridiculous. We were told our table had the check and they were just waiting for them to leave...ok. Change my table. Then “let me see if your table is set”. Then, “I had to set your table myself”. Little do you know you’re talking to 2 former F&B managers. We know how this works. Am I supposed to be delighted you decided to seat me at all? Were you doing me a favor? You ignored me, talked about me (audible to my whole party) and then act placating in front of my client who has flown in from Asia for this meeting. It was humiliating. Then, once seated, we were not visited until 1:31 when the server attendant arrived with water. It all just ran downhill from there. I’ve forgotten how pretentious SF restaurants can be but this was a good reminder. Great place - amazing food. Just wish there were some spots a little quieter when we invite clients! The food was delicious and the service was impeccable. I noted on the reservation that it was a birthday celebration and the staff went out of their way to make my guest feel special. The food is consistently good, but the drinks are not always good. The iced tea is often extremely bitter. Hot tea service is good. Cocktails are generous and well crafted, but expensive. Wine service is good. Desserts are always interesting, but sometimes is seems like there has been more thought given to presentation than to taste. Absolutely Fabulous on all counts. The food was creative and delicious. Our Waiter was very personable and informative, and did a great job. It reminded me of being in New York at a great restaurant/tavern in an old house or building. We look forward to going back again.